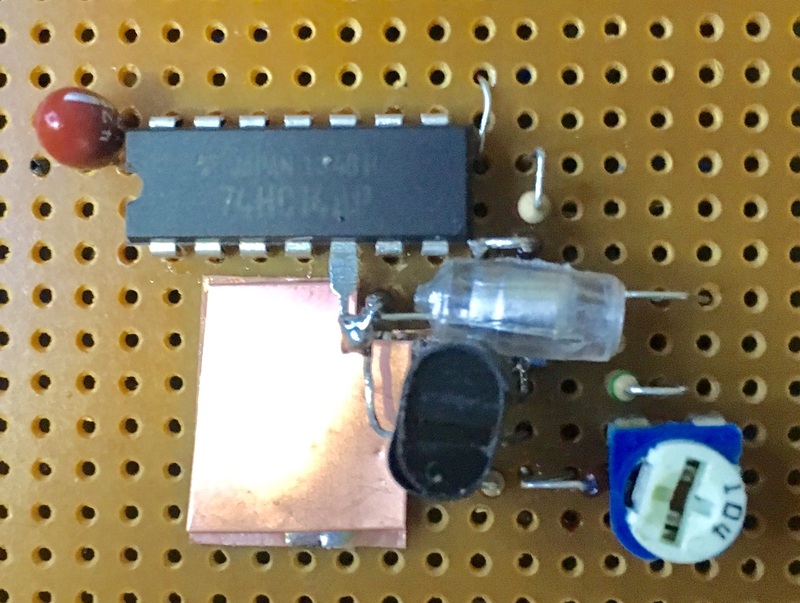 A thread on SDIY discussed high frequency VCO's "... a clock that can be swept from 250kHz to 3MHz without any glitches". The CD4046 is a commonly selected option but 3MHz is just out of range. There is a 74HCT version but .. let's first try an alternative. 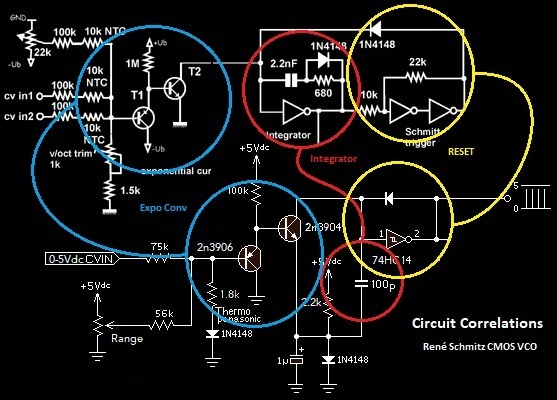 The graphic below depicts a, not very many parts, Utility VCO with better than 250kHz to 3MHz range that operates with a single 5Vdc power source. Just another variation of René Schmitz's CMOS VCO ... now extending itself into CD4046's territory. 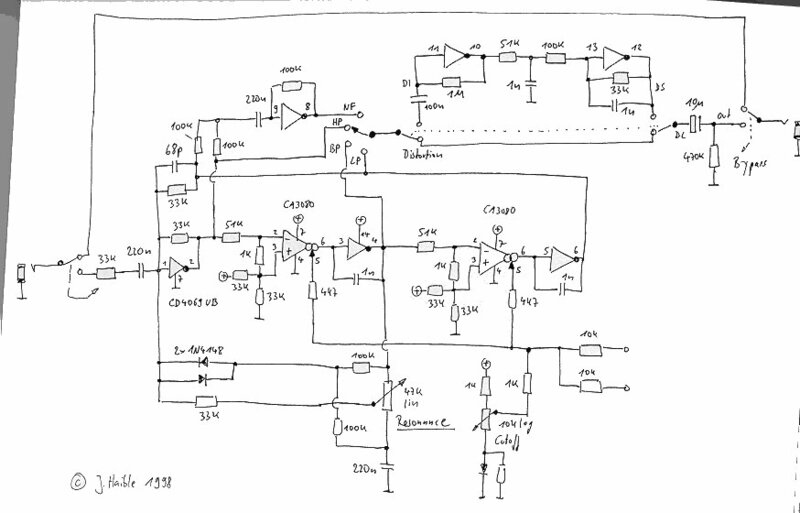 I have always wanted to give this linear CMOS VCO approach a try, and the RESET pulse of an sawtooth oscillator (when buffered) makes a nice clock output. The example i built works well, and requiring so few parts, it was too easy to build. CV Exponential Conversion: There are differences in the implementation of exponential converter for this circuit vrs. René's circuit. 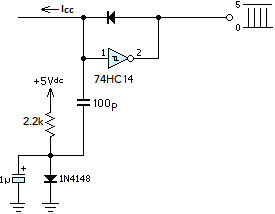 This circuit, intended for integration with companion digital components, is characterised for a single +5Vdc power supply. Typical of single supply circuit configurations, the 'common' rail must be "built out". Targeting +5Vdc power, we adopt a E.Williams approach. We lower the 'common' to a diode drop above negative for maximum usable range. 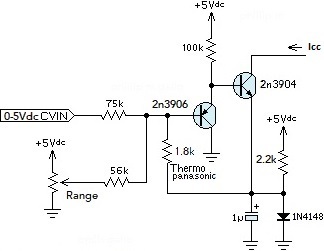 This circuit employs the typical PTC thermo-resistor as the "shunt" element of the VCO CV scaling voltage divider. 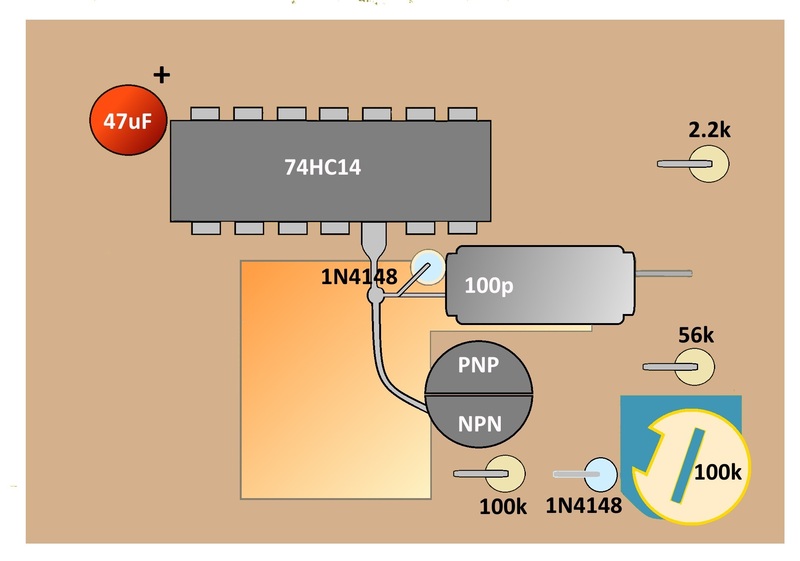 René's circuit employs a novel approach where a NTC thermistor performs as the series element of the voltage divider. In regards to CV to Frequency scaling, a 1V/8ve VCO would employ a 100k input resistor where we presently indicate a 75k. Commonly, either it or the 1.8k thermo-sensitive resistor would have a series trim to allow accurate tuning. As a "Utility oscillator" we select a "fixed" ratio representing a scaling that "felt best" when operating the Panel Control. The scaling shown above is ~ .7V/8ve (75k resistor instead of 100k). Following the red trace the integrator cap repeatedly discharges until it reaches just below the 'HC14 schmitt trigger's lower switching threshold. Suddenly, the gate's output (yellow) toggles high, the diode conducts and the capacitor is rapidly refreshed to a level just above the upper switching threshold. Suddenly, the gate's output toggles low. The cap will now exponentially discharge at a rate programmed by VCO Freq. Control Voltage scaling. The waveform depicted by the Red trace is drawing the width of the 74HC14 Hysteresis window, a dead band of ~.9Vdc . RESET has a fixed width (~20nS) which is 6% of wavecycle @ 3MHz. The integrator discharge is programmed into the exponential current sink by the Control Voltage and RANGE trim. This is the typical Integrator-Reset Sawtooth configuration. It is implemented with HCMOS employing a single gate to; (1) buffer the integrator capacitor; (2) act as a switch driver with hysteresis. The diode is the switch. These functions implement in 3 gates in the original design. Inspired by Jürgen Haibles use of CMOS buffers in his "Wasp Filter clone", René Schmitz started a "quiet riot" with the web publication of his "CMOS in linear mode" exponential sawtooth oscillator. There have been many variation of this VCO approach, why not extend it into the CD4046's territory. The graphic below attempts to show the correlating constituent circuits in common between this and the René Schmitz VCO. National Semi CMOS Linear applications : Here National Semi woke many of us up to linear applications for that extra gate that often occurred on an otherwise 'digital' board. Jürgen Haibles's Wasp Filter : René's inspiration to try linear application of CMOS gates. René Schmitz : René, like many on the SDIY list, publishes circuits and designs for others to consider, build, and enjoy. His 2001 publication of a exponential integrator/reset VCO, employing CMOS in linear mode, using standard synth power rails, .. surfaces everywhere. Scott Gravenhorst : Scott published a linear CV variant which included waveshapers and integrated LFO. Osamu Hoshuyama: Sam publishes his wealth of designs and research. He gives René's oscillator the serious big time module treatment as a peer to any DIY VCO modules. masa921 : A 9Vdc single supply implementation with the common reference at 1/2 Vcc. Mark Shaner : This CD40106 version exploits CMOS's very HI-Z input and the inverting schmitt trigger switching to realize part reduction in exchange for fixed hysteresis. A linear or exponential current sink is shown. 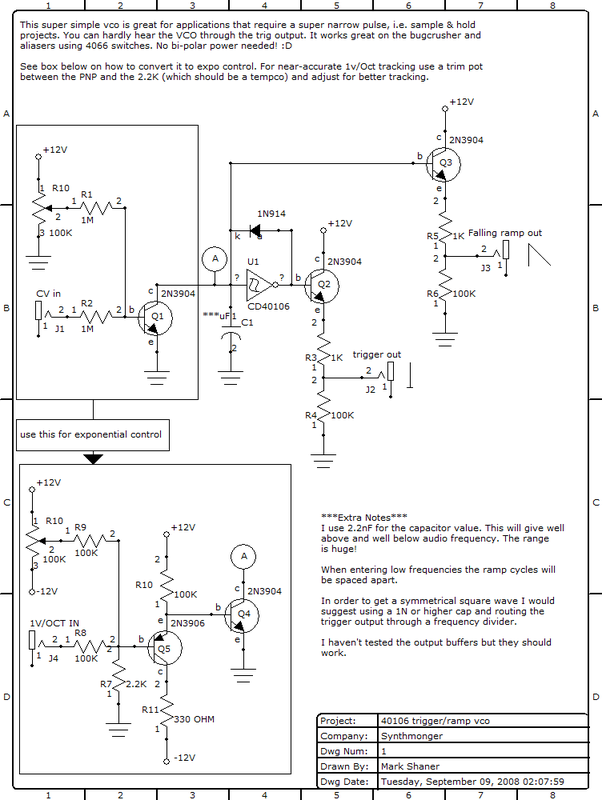 Elliot Williams : Hackaday article about simple exponential VCO. 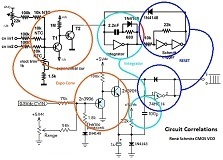 Single supply implementation for low voltage use.